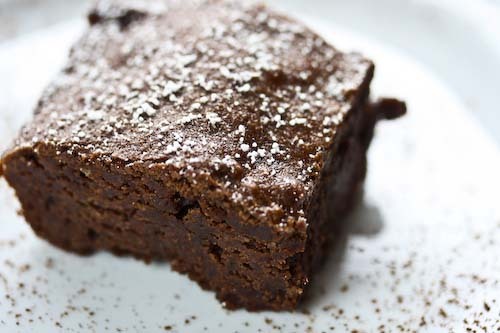 There are a few people I want to butter up with these brownies. You, first of all, if you're still bothering with this little blog. In my defense, I did warn you that I'd be studying for orals until December (until December 10th at 10:00 am to be precise). I don't think I excepted things to slow down quite this much, but I didn't expect twelve hour study days, either. So there's that. The other person these brownies were meant to butter up is our new super. At the last apartment, our horrible landlord decided to stop paying the super, which meant nothing ever got fixed or maintained. But I'm smart enough to know that when you have access to someone who actually fixes things, you should be very nice to him. You should give him brownies. Here's a recipe you can use. Oven preheated to 325. Line a 9" pan with aluminum foil with 2" of overhang around two opposite edges. Grease the foil. In a double boiler, over lightly simmering water, melt the chocolate and butter together stirring until smooth. Transfer to a bowl and set aside. With a wooden spoon, beat the cocoa powder and sugar together until well mixed, then beat in the eggs one at a time. Mix well after each addition. Beat in the sour cream and vanilla, then add the flour and salt. Mix until just blended and stir in the pecans. Pour the batter in the pan and bake for 40-45 minutes until a toothpick comes out with a few moist crumbs. Remove the pan to a wire rack and cool completely before lifting the brownies out by the foil. Cut into 16 square. good move, Andrea. That is exactly what David Lebovitz recommends doing in his book, The Sweet Life in Paris. And yours look delicious. You can butter me up anytime with these! Oooh, I'll bet the bittersweet chocolate in these makes 'em yummy. These look amazing! I really need a brownie now, lol. I came over from Stirring the Pot to check out your blog, great recipes! These brownies look amazing! Love just about everything Tish does, so will have to try these--am sure they are a homerun! Will have to remember these for my super this year. BTW- Your blog is fantastic!